We here at EcoWise Planters love growing certified organic, open-pollinated heirloom vegetables from seed. Besides being cost effective and readily available online from local growers, these types of seed offer up an abundance of bio-diverse plants of which the seeds can be saved for future plantings. To make the most of your seed sowing we have compiled a few tips to get you started growing delicious, healthy and fresh produce. Soak the seed overnight in warm water, sowing the following day. Place the seed on moist paper kitchen towel, in a sealed clear plastic container or zip lock bag store on a warm windowsill where they will be exposed to sunlight and heat while enjoying the moisture. 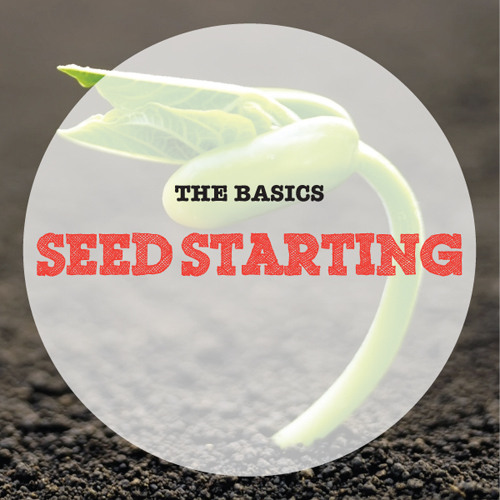 If soaking seed until it sprouts, check the moisture level daily, topping up with droplets of water if necessary. If by chance mould develops, tenderly rinse the seed and return it to a new, moist, paper lined container or zip lock bag. Only plant seeds that have germinated, keeping them moist but not wet. Germination rates vary, to avoid disappointment sow 2 large seeds together, when the seedlings are 15cm high remove the weaker plant by snipping it at the soil line with sharp scissors, toss it into a stir-fry mix, salad or the compost heap. Smaller seed can be broadcast and thinned out in the same manner. You will find germination times on seed packets however; most seeds start to sprout above the soil somewhere between 1-3 weeks after sowing. Legumes and root vegetables do not transplant well from plastic cell seedling trays and should be sown where they will grow, however getting an early start in a sheltered position is sometimes required, therefore an alternative is to start them in biodegradable materials. Toilet rolls, hand rolled newspaper pots, egg carton cells, peat jiffy pots, peat pellets and recycled paper trays are all biodegradable options. A nifty idea floating around Pinterest is using spent eggshells, although we are yet to try this method we love the idea of the added calcium for tomato seeds. If you start seed in biodegradable containers be sure to soak them well in water before planting out and do not interfere with the delicate root system by removing any planting media, simply plant them as is. The general rule of thumb when sowing seed is to plant large seed at a depth that is twice their diameter. For small seed broadcast it into a very shallow channel and use a sieve to gently dust a fine layer of soil over the top. When seeds have been sown in seed trays, wait for the seedlings to reach 15cm in height before planting out into your Ecowise Planter, this will prevent transplant shock. Check your seed directions for spacing requirements and be sure to gently remove the seedlings, not disturbing the roots. A diluted liquid fertilizer feed after planting will make for happy seedlings. Be sure to water regularly and fertilise as recommended. Emerging seedlings are fine fodder for many pests and will need some tender care until established. Copper tape adhered to the top frame of your EcoWise Planter will deter slippery slugs and snails, crushed eggshells and coffee grounds scattered around seedlings also help. Our favourite protection is cloche like guards made from used plastic milk or soft drink bottles, be sure to thoroughly wash them before use. Other ideas include spent orange halves and beer traps. Be sure to mulch after your plants are established, pests easily shelter within dried, straw like mulches, slaters aka ‘butchy boys’ are especially fond of it. Planting thickly with companion plants or growing living mulch will protect seedlings from soil moisture loss when traditional mulch is not appropriate.